INTRO: I’m off to Africa for almost a month—to celebrate my new “empty-nest” status. It set off a story idea for me—one that has largely gone under the radar, and is very bullish for oil prices. U.S. shale production represents roughly 7% of global oil production. On a daily basis we can read stories about the explosive growth of U.S. shale and how it is constantly a threat to investors and sustained oil prices. Half way around the globe oil production in Africa represents a very similar percentage of global production. But let me ask you this…….. When was the last time that you read a news story that told you how African oil production as a whole was doing? Yes, me too. The answer is pretty much never. If the financial media were to spend a little time digging into the African oil production story they would be better able to explain why Brent crude prices are suddenly all the way back up to $85 per barrel. And why those prices could be headed higher…. There are now seven different African countries included in OPEC. I bet that none of the egghead contestants on Jeopardy could name them all. I’m certain that the talking heads supposedly providing oil market expertise on the financial networks couldn’t. In alphabetical order those seven countries are: Algeria, Angola, Republic of Congo, Equatorial Guinea, Gabon, Libya, and Nigeria. Production from this African OPEC contingent peaked in 2012. At that time this group of countries were producing a combined 7 million barrels per day which accounted for 8 percent of total global supply. At this 2012 peak these African countries were producing more than the entire United States. Since then fortunes have changed. While U.S. production has zoomed on the back of the horizontal revolution African production has struggled across the board. From 7 million barrels per day in 2012 production from the OPEC African nations has declined by more than 25 percent —- now struggling to hold 5 million barrels per day. It is an amazingly underappreciated story. 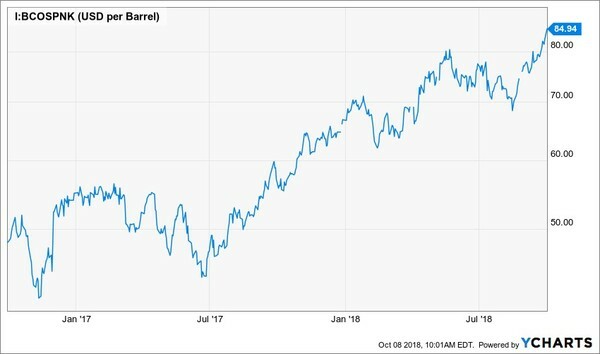 The threat to Iranian production from President Trump’s sanctions is not nearly as large as this 2 million barrel African decline…….yet the Iranian issue is a headline oil story while this African decline has gone virtually unnoticed. The African continent has lost nearly as much production as the entire production of Kuwait or United Arab Emirates. If either of those countries were to completely shut-off production it would be a major event. This African production decline would be like production in the Bakken and Eagle Ford going to zero. Could you imagine the panic if that were to happen? Shale oil production is a different beast. There is very little lag time between capital being spent and production coming on-stream. Outside of shale though, the oil and gas business is very different. Conventional production usually involves big projects that require multiple years of development before production kicks in. When oil prices crashed in 2014 international conventional projects that were started before the crash were seen through to completion. That has supported production globally over the past few years. Spending on similar new projects was mothballed. The impact of that spending curtailment is really just kicking in now — especially in these African countries that have had oil production cash flows crunched. Africa has already experienced a major production decline and there really aren’t any bright spots going forward. While it isn’t quite the hot mess that Libya is, Nigerian production is not in good shape. The security landscape is chronically unpredictable with regular production disruptions. Total production doesn’t get cut in half overnight like it does in Libya, but hundreds of thousands of barrels or production are regularly offline. 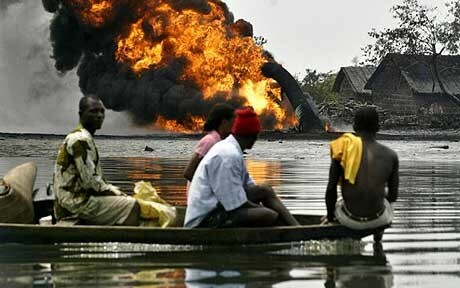 The Niger Delta Avengers method of operating remains the same —- frequent attacks targeting production platforms and pipelines including those owned by the likes of Chevron (CVX-NYSE), Exxon (XOM-NYSE) and Shell (RDS.A-NYSE). Production in Nigeria which was well over 2 million barrels per day in 2012 now drifts around 1.5 million barrels per day. With the dangerous environment discouraging large international operators to spend money–it is hard to see Nigerian production surprising to the upside. With explosions a regular course of business, a downside production surprise is very possible. Unlike many of the other African producers, Angola’s challenges are not of a security nature. However, Angola is going to be ground zero for the impact of the post oil crash shutdown in deepwater spending. French major Total (TOT-NYSE) just put its $16 billion deepwater Kaombo project on production. After that though, the cupboard runs bare. That is a problem, because as a purely deepwater producer Angola’s production declines at a pretty steep clip. 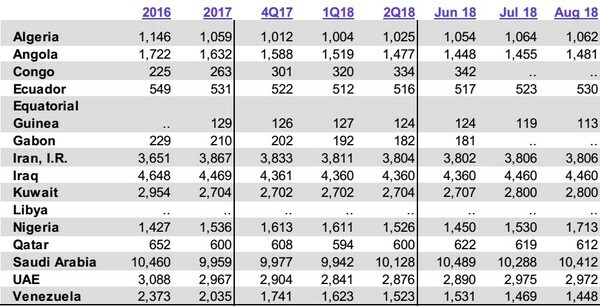 Not shale production steep, but deepwater production declines that aren’t supported by continual spending show up quickly. There is nothing wrong with Angolan oil production that billions of dollars of exploration spending can’t cure. The problem is that there isn’t anyone willing to spend those billions of dollars. The IEA sees Angolan production falling below 1.3 million BOPD by 2023. I agree. Relative to its neighbors–Tunisia and Libya which saw their governments toppled in the Arab Spring–Algeria has been downright stable as a country. But the Red Queen never sleeps. That is the problem facing Angola. The country’s oil industry can’t run fast enough to keep up with production declines. Angola is suffering the long, slow, long-term decline that mature production always does. 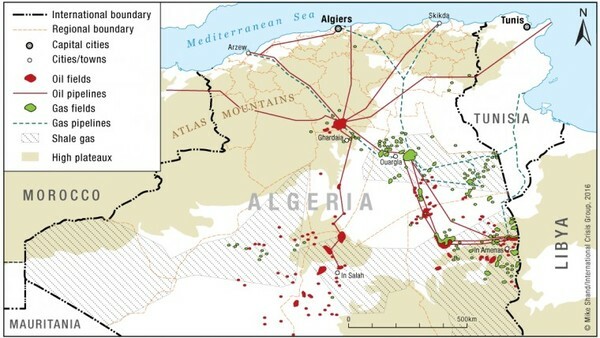 Algerian production now at just over 1 million barrels per day is down 20 percent from 2012. It isn’t volatile, but it is declining —- and it is not going to be heading higher. What can I say about Libya? Since the fall of Qadhafi in 2011 Libya has been in a state of complete anarchy. There is no producing region on the planet with production this volatile. And there is no reason to think anything is going to improve. The biggest challenge confronting Libya’s oil production is control of the country’s oil export terminals. The control over those terminals has been switching back and forth between various militia groups — none of which are good news. Every time one militia group takes control of an export facility from another it does so by bringing serious damage to the facilities during the siege. And when it comes to actually drilling new wells in the country……forget it. There is no international operator going in there both by choice and because there is no chance of getting insurance. The rise in Brent crude prices has not been factored into the stock prices of many international producers. Not even close. These companies are trading at absurdly cheap valuations of cash flow and they are growing…….FAST! No company is as cheap as my favourite Bakken producer in North Dakota. I think it has the highest netback (netback=profit per barrel) of any producer I see right now in the USA. And all these African issues will help keep global prices high. I think their next operational update will be a HUGE catalyst for their shares….get the name and symbol of this oil gem right HERE.